All organisms demonstrate a tendency to avoid harm. Even amoeba will avoid aversive stimuli. This is one of the basic premises of behavioral psychology's operant conditioning. Behaviors that yield pleasing results tend to be repeated. Behaviors that yield aversive results tend to not be repeated. Amoeba have no need for morality, only self-preservation. If we were to stop right there, we would have an argument for hedonism, indicating no need for morality. But, we are not amoeba. Humans are social animals requiring the assistance of other humans in order to survive in the natural environment. For humans, self-preservation is interdependent with preservation of "the tribe." Other social animals like wolves, lions, and buffalo will predictably behave in ways that promote the health and safety of the group over the health and safety of the individual. These animals engage in what might be considered benevolent behaviors even without the benefit of higher cognitive functioning. To my knowledge, humans are the only species capable of true empathy. Empathy does not mean sympathy. Many species demonstrate sympathy. Empathy requires the complex ability to cognitively attempt to see through the eyes of another. With huge effort, it is possible to put our collective ego aside and on some level understand the world from another person's perspective. Research on feral children has shown that empathy is a learned behavior. Empathy is an extremely difficult cognitive skill that few humans try master. If humans developed and regularly employed this skill, conflict with each other and the destruction of other species could be virtually eliminated. group. 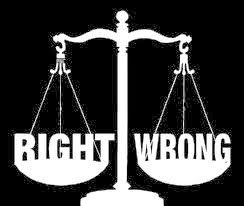 To employ this litmus in making moral decisions, one must not only, "do unto others as you would have them do unto you," but also consider how others would wish to be treated from "their own" perspectives and not just your own. Many thanks for the feedback, Gregory. I understand your point that ultimately, the outcome is what matters. So, animals who demonstrate altruistic behaviors benefit their social group regardless of what internal mechanisms motivate them to do so. Enjoyed the article very much and I think it does help clarify the evolutionary movement towards empathetic behavior. I do draw a distinction between sympathy and empathy. Or maybe it would be more clear to modify the terms. I think of sympathy as relating to the Golden Rule. Sympathy, I'll call simple empathy, does not require complex cognitive skills. It is akin to an instinctual behavior. "I would not like to be treated like that, so I feel sympathy (or simple empathy) for an associate who is receiving said treatment." Complex empathy, on the other hand, is not a particularly natural behavior. Humans are ego driven creatures and complex empathy requires a conscious effort to set aside ego and truly try to understand a situation from another's perspective. For instance, it is easy and natural to feel sympathy, or simple empathy, for a child who has been sexually abused. Our hearts goes out to this poor child and we feel a visceral reaction to the child's suffering. It would require complex empathy to have any compassion at all for the same child 15 years later, when he is now the perpetrator of sexual abuse. It is easy to feel sympathy for someone with whom we can easily relate. But, great effort may be required to demonstrate empathy for folks with whom we have difficulty relating. It is natural to feel compassion for your own child's suffering, but it may take some work to generate the same compassion for thousands of suffering children in third world countries.